Paramount, widescreen 1.66:1, languages: English DD 5.1 & Surround [CC], French Dolby Surround, subtitles: none, single side-single layer, 24 chapters, 2 theatrical trailers, rated PG, 103 min., $29.99, street date 1/26/99. Directed by Peter Weir. Starring Jim Carrey, Ed Harris, Laura Linney, Natascha McElhone, Noah Emmerich, Holland Taylor. Welcome to The Truman Show. The whole world is watching. The Truman Show came about from the brilliant and complex producer, Christof, winner of an Academy Award for a moving documentary of street people called Show Me The Way To Go Home, when at the age of 29, he sold the concept of The Truman Show to Moses Opperman, President and CEO of the world's largest media conglomerate, The OmniCam Corporation. The company was an overnight success when its camera devices were used by millions to telecast their private lives through the Internet. On television, this type of reality-based telecast is made popular by such shows as MTV's Real World, where the lives of culturally diverse twenty-something are brought in to live together under multi-camera scrutiny, and by The Jerry Springer Show, where guests reveal their most shocking secrets to their partner(s) in front of a live audience. However, unlike those reality-based shows, the difference on The Truman Show is that the main character is blissfully unaware that he is on the air. While it has a few detractors during the course, The Truman Show maintains an overwhelming support by critics and fans alike and evidenced by the numerous nominations and awards. Rex Reid praises it as "one of the most original and provocative show ever produced" and Esquire Fashion as "captivating and divine." For those discernable readers that have watched the movie or read the Studio Line section, I hope you realize that the facts on the above paragraph are mostly fake (some are from the Introduction by director Peter Weir on The Truman Show: The Shooting Script), and that in a nutshell is what The Truman Show is about. Christof is, of course, a fictious character in the movie as with OmniCam Corporation. If you are a reader who is unaware of the story, you might readily accept what I just presented as a reality. 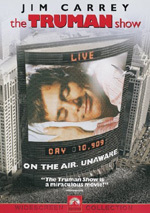 Screenplay penned by Andrew Niccol (Gattaca), directed by Peter Weir (Fearless, Dead Poets Society), and starring Jim Carrey in a terrific performance, the reality as known to Truman since birth is all fabricated in a giant studio and broadcasted live to the whole world 24 hours a day, 7 days a week. In today's media-saturated world, The Truman Show raises some provocative and interesting issues, but ultimately, as a social commentary or satire, the movie never fully addresses the issues that it raises. The concept is certainly fascinating and entertaining, so much so that I wish the movie could be longer. At only 103 minutes, the characters are under developed and we are not given the oppurtunity to explore the inhabitants in the show or outside of the show. In the end of the movie when the door closed, there wasn't much of a revelation and left me unsatisfied with more questions than answers, and perhaps that's the effect that Peter Weir aims for -- to step out of the boundary and learn the truth for yourself. That might be the case, but the movie could have been much better and that applies to the DVD release also. On the DVD production, The Truman Show DVD is the first to incorporate animated menu from Paramount and I am really impressed by the design. It's cool to see the blimp goes by during the selection. Thankfully, the audio formats could now be selected during play, previously it could only be done on the menu. The spherical film is presented at the theatrical ratio of 1.66:1 and while it is not 16x9 enhanced, the presentation is perfectly framed and centered. The compression, thought, is a disappointment. On my Panasonic A110 player, the picture exhibits some video noise, strong shimmering on patterns, and even jittering on a few static backgrounds. That's totally unacceptable at this stage and for such a high profile movie. The print also contains few dirt particles. Colors, however, are fully saturated with beautiful shade of hues and accurate fleshtones. Images are sharp and brightness is extremely luminous. Blacks and shadow details are well defined. The encoded DD 5.1 soundtrack is not particularly impressive and lacks a strong surround presence. The discrete effects are rarely used, but do get involve more aggressively during the storm sequence on the latter part of the movie. Imaging and panning is adequate, but again does not project to a large soundstage. What the soundtrack does have that I really enjoy is the score composed by Burkhard Dallwitz and Philip Glass. It's one of the more eclectic score, combining various styles and elements, and in fact, Philip Glass uses some of the cues from his previous films. Peter Weir describes the selections as what Christof would have chosen. The overall structure retains the intimacy of what you'd expected from a television show. Ranging from a lovely piano concerto by Chopin to a cue of swelling orchestration during the reunion that aims for teardrops. Other times, the heavily synthesized cue is eerily sharp and harsh in reflecting the artificial environment and technology that enslaved Truman. The score was recently awarded the Golden Globe, and while I feel James Horner's Mask of Zorro and George Fenton's Dangerous Beauty would be a better choice, The Truman Show makes for a very interesting experience.